A 24 year old science buff from Caerphilly has quashed gender stereotypes to secure her dream job as an aircraft engineer after completing an apprenticeship with GE Aviation. Jade Babbington left school in June 2010 at the age of 17 after completing A-levels in Maths, French and Chemistry. Like many of her friends she opted for the academic pathway and started studying for a master’s degree in Engineering at Cardiff University. After just six months, Jade realised that classroom-based learning at university was not the hands-on approach she had enjoyed while doing work experience at GE Aviation during her summer holidays. After deciding to look at alternative routes into her preferred career in engineering, she came across the opportunity to do an apprenticeship in Aircraft Engineering. In September 2011, Jade started a Level 3 apprenticeship in Aircraft Engineering at GE Aviation where she spent three years rotating around the shop floor, learning skills in building, repairing, inspecting and overhauling engines. Since completing her apprenticeship in June 2014, Jade has gone on to undertake an Apprentice Assessor NVQ and is currently studying a foundation business degree part-time at the University of South Wales. She has also completed her Level 2 ILM qualification in Leadership and Team Skills. Louise Burnell, GE Aviation’s Apprentice Coordinator said: “Jade has been an outstanding apprentice and highlights just how far apprentices can come in such a short time. “Our apprenticeship programme is extremely well established within the business and is held in high regard across GE and the wider community. 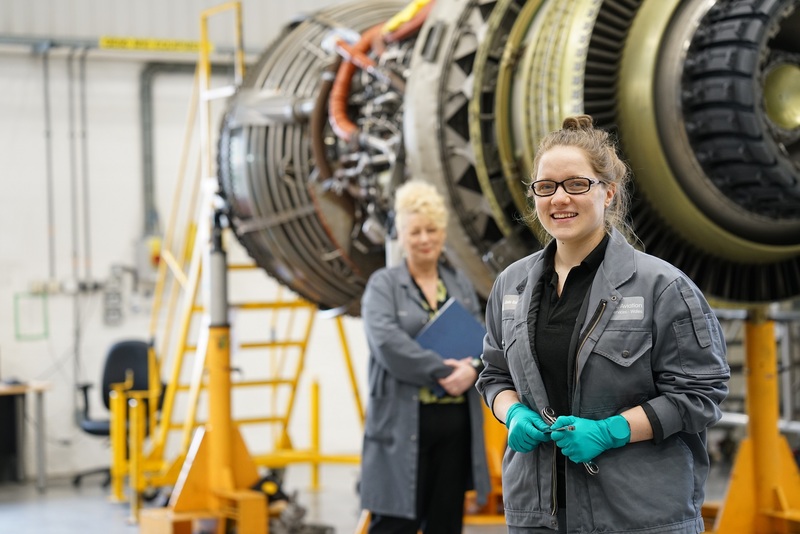 Minister for Skills and Science, Julie James, said: “In Wales, the number of employers offering apprenticeships is on the rise and I’m encouraged to see organisations like GE Aviation committing to up-skilling their workforce.